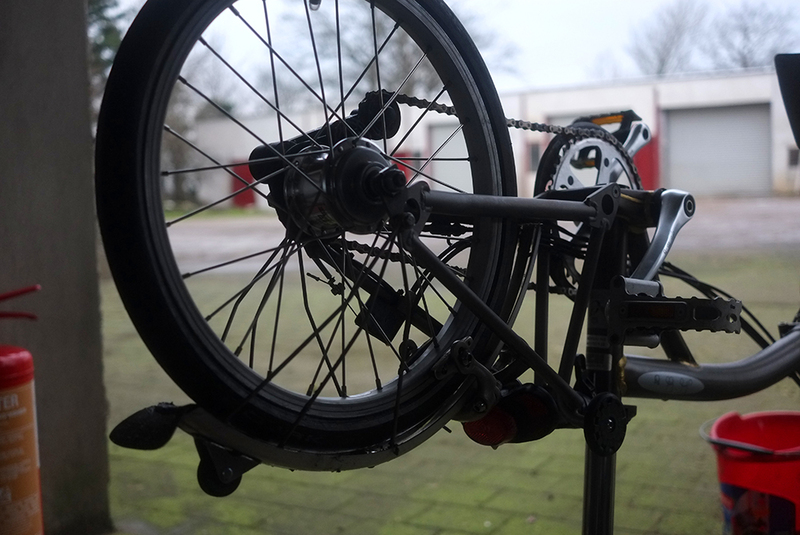 Yesterday afternoon I decided to do some maintenance on my folding bike's mud-encrusted drivetrain. Although when I say "decided" what I really mean is shamed into it ("Look at the state of that thing - It's a wonder your gears don't seize up!"). Some cyclists are, shall we say, a bit more fastidious than I am when it comes to bicycle maintenance. But on this occasion even I conceded that my everyday transport bike deserved a good wash. After all, it had been over a year since the last time! And so the next several hours were spent cleaning the bike - starting with extracting packed dirt and grit out of all the nooks and crannies in its maze-like system of pulleys, and (since, let's be honest, one tends to get carried away with these things) ending with polishing the hubs, spokes and chain links till I could see my crazed reflection in their surfaces. It was then it occurred to me that instead of cleaning the chain, I should probably be replacing it by now. But, oddly enough, it is coming up on my 3rd year Brommiversary, and I have yet to wear the chain out - or any other part for that matter. That's right: After 3 years of owning this bicycle and using it as my main utility bike in all-weather conditions, I am still riding on the original tires, tubes, chain, brake pads, et cetera. And, while I am certainly not complaining about the milage I've managed to squeeze out of this machine without spending a penny on its upkeep, I do recognise that my experience is unusual ...which reminds me of a topic that's come up in the comments of several recent posts: What to expect when it comes to wear and tear on your bicycle. To be sure, the topic is widely covered in cycling literature. There are helpful websites and magazine articles that will tell you roughly how often you ought to replace your chain, cassette, and other parts. Your local bike shop will provide some figures as well if you ask them. But such advice tends to be based either on typical use case scenarios, or on the advice-giver's own. In reality riders can find that their own experiences differ wildly from commonly accepted estimates. And so, despite the abundance of advice, impassioned debates ensue over whether a chain must be replaced every 1,000 miles or can in fact last over 10,000 miles, and similarly exciting questions. Unfortunately, you will not find answers to these questions here. In fact, what I'd like to suggest is that there is no answer. At least no simple, generic answer that will be of use to everyone. The only way to know how much wear and tear to expect out of your bike, is for you to ride that bike and see what happens. Because in real life there is no such thing as an average, or prototypical use case scenario. There are just too many factors that can influence the rate of wear and tear on our bicycles. To start with the obvious, quality of components matters. It is a simple concept to grasp, but we still forget - especially when we're trying to save money at time of purchase. But the fact remains that cheap parts wear out sooner than well-made parts. Delicate parts wear out sooner than durable parts. This must be considered when estimating a component's lifespan. Equally important are the conditions we ride in. Cycling on pothole-ridden roads jiggles and stresses parts. Prolonged exposure to salted roads and salty air has corrosive effects. Inclement weather puts more wear on parts than fair weather. Rough terrain puts more wear on parts than smooth pavement. Over the years I've noticed that I wear out chains and brake pads on all-terrain roadbikes at a much quicker rate than on paved roadbikes. This is because grit and sand get into the drivetrain and the brakes where, even in the course of a single long ride, they can do quite a bit of damage - especially in the rain. Perhaps less obvious but no less important is how we ride. How often and in what manner do we use the brakes? Do we constantly change gears? Do we pedal under load? Do we stand out of the saddle? Do we cross-chain? Do we hop curbs? Do we skid? Do we pedal-strike when cornering? Do we crash often, or let our bikes fall over carelessly? There are different ways to use equipment, with some riders being naturally rougher or more heavy-handed than others. We may not even notice which way we are, but it certainly plays a role in component longevity. Related to this are individual factors such as rider weight and strength. A heavier, more powerful rider will put more stress and wear on their bicycle's parts. Some interesting anecdotal evidence pertaining to this can be gleaned from couples who cycle together long distances, putting in similar miles on similar equipment in identical weather conditions. Typically, the heavier and stronger of the two will wear through components - in particular tires, wheels, chains and cassettes - at a faster rate. There are myriads of other factors to consider - from whether (and how) the bike carries loads, to how well the machine is maintained and where it is stored. But the truth is, when all is said and done there still remains the wild card factor. There are riders who couldn't wear out a chain or a set of tires if you sent them on a race around the world. And there are riders who are prone to snapping crank arms, handlebars and seat posts with alarming regularity - despite a slight physique and a seemingly light touch! It would seem that all sorts of unique individual characteristics - from a cyclist's position and pedaling style, to their aura, pheromonal signature and general je ne sais quois - can have unexpected and puzzling effects on component wear. So, whatever your experience with wear and tear on a bike has been, it is probably normal. Even if it differs from that of your friends' experiences and the experiences you read about on various blogs and forums. So far I have been pretty lucky with how little wear and tear I've had to deal with on my main utility bike and roadbike. To ensure the trend continues, I will try to improve on my bike maintenance habits. 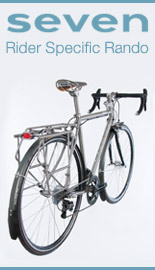 And perhaps I will get a shiny new chain for my folding bike after all - after 3 years of service, she deserves it! You ? Carried away with "something bicycle related" ? When talking with friends about their bikes and what they do or recommend to maintain them I particularly enjoy their insights, their experience, their pet peeves….You're a friend, right? So what do YOU do? Do you do the work yourself? If so do you discover little tricks which make it easier, certain products used to clean up parts? If not, are there any stories or warnings about who you allow to work on your bikes? Given your budget are there some things you get the highest end possible and others where you decide to get by with lesser quality? Just curious and I think you'd be surprised at what a reader my take from the details of your experience as they navigate their own. Most of the bicycles I've owned have required little to no maintenance, so I haven't had the opportunity to develop rituals and tricks. And thank god, because I do not especially like working on bikes. As far as assembly and swapping parts, I sometimes do the work myself and sometimes I do not. It depends on whether I can find someone I trust to touch my bike and on whether I can afford to pay for it at the time. But if those two conditions are met, I don't mind saying that I prefer not to do the work myself. Even though I am now physically capable of handling most of it, it takes me much longer than it would a mechanic and brings me no special satisfaction. I would rather spend that time doing things I enjoy or am good at or can get paid for, and leave the bike wrenching to those who feel the same way about it. In the past I've written several posts addressing this topic, and still feel pretty much the same way about it. Bicycle DIY: Is It Worth It? As for your second question, what I try to explain when people ask me this, is that it's not just about budget but - more importantly - about use case scenario. For example, if you are shopping for a bicycle that will serve as your chief means of transportation (i.e. you do not own a car and have limited access to public transport), features such as reliability, durability, and visibility take on special significance. You cannot afford not to afford them. Another example, if you're shopping for a roadbike: The importance of certain features depends on how/where and for what distance you plan to ride it. 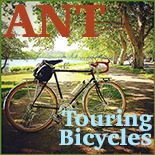 On a bicycle that will be ridden long distances in remote ares on one's own, certain features become more important/valuable than on a roadbike that will be used mainly on 30 mile club rides. So my advice here would be: First figure out what you want/need a bicycle for, and what features are important for that purpose. Then see what part of this your budget can accommodate, and figure out how to stretch it if necessary. Exactly, there is no point worrying about being stuck in the middle of nowhere if you aren't riding the bike in the middle of nowhere. I've got hub gears and hydraulic disc brakes on my weekday urban commuting bike precisely because they are very low maintenance and if something did go wrong with them then a) they aren't the sort of components you can do roadside repairs on and b) I'll always have an alternative way of getting me and the bike home even it involves walking all the way or spending money on a taxi. I clean and oil my bike - all mechanical matters and parts replacement I leave to the experts at my local bike shop - they have the tools and the expertise to ensure my bike is in the best condition. I have not the slightest interest in being an amateur bike mechanic. The professionals go about, what is truly their business, quietly and efficiently, whereas I have observed the amateurs seem to engage in much verbal puffery and at times, quite unseemly boasting. The layers of dirt form a protective shell, much like adobe bricks. Your lax cleaning schedule is surely the reason for your components' longevity. There is that hypothesis. But there is also its opposite, which suggests that leaving salty grit in the drivetrain to percolate speeds up its demise. Since I rotate bikes, I don't come across wear and tear problems much. I am good at keeping my bikes lean. The better care you give bikes, the better the ride and less chance of getting stuck out in the middle of nowhere. Which is why to use a chain wear gauge, readers, and change the chain as suggested: chains are cheaper than new chainrings and cogs. As for the rings and cogs, any sign of 'shark-toothing' (remember, some chainrings can be turned over, but not those with pins etc.). Brake pads are cheap, vital, and easy to brush the junk out of, and cheap to replace. Tape? 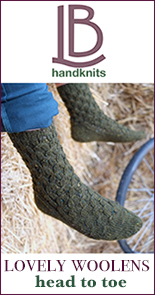 I use cotton and shellac them, which lasts for season after season if you have enough coats. Cables? I admit to using them until failure (or until fundamentally changing derailleurs or brakes), but I have had few failures, since I avoid shifting and braking too often (what that would be is all judgment call). This is another reason to have a fixed gear in your stable: it teaches a more efficient style. What other consumables are there? Lube and grease? I do not repack hubs and the like often enough, but as soon as there is any sign of trouble. Once again, because it ends up far cheaper to address it sooner than later. I am pretty good on keeping my chain clean-ish, but not religious. Not long ago, cooler heads warned me that this whole commuting-by-bike scheme would prove to be complicated, frustrating and expensive. Two years and 2,000 miles after rolling out my restored Bridgestone MB3 Magic Commuter, reality came home to roost. Had to replace the brake pads -- front and back -- last fall. That's $10 I'll never see again. Sometime this year, I'll likely have to spring for a new set of tires because the sidewalls of my Ritchey Tom Slicks (moved to the Bridgestone after being ridden on another bike for a couple of years) are starting to crack. And that doesn't include the two or three inner tubes that I've had to replace. Not sure if that amounts to "normal" wear and tear. Anybody know where I can find a nice used Hummer? Surely that would be a lot more sensible way to get to work. "...and (since, let's be honest, one tends to get carried away with these things) ending with polishing the hubs, spokes and chain links till I could see my crazed reflection in their surfaces." That is exactly why I hate cleaning my bike. I can either knock the chunks off, or make it look like new; I have no in-between. Since I waste enough of my life doing it to customer's bikes at work, my enthusiasm for doing it at home faded away years ago. And btw, I don't think you're 'wasting your time' when working on customers bikes. The few times I do take my bike into a shop I'm immensely grateful for those who pay proper attention to it's needs. Last week, just before closing, I dropped off a bag of my favorite bottled beverage for the mechanics who helped make my ride cleaner and more efficient. Your efforts bring smiles. Customers do notice and appreciate good work. I was talking to a woman recently who said she values a good bike mechanic more than a good gynecologist. I would have to agree! I suppose that saying that I had wasted enough of my life cleaning customers' bikes was brash, I simply meant that I tend to get obsessed with over-cleaning the things before I actually get down to repairing them. It's my least favorite part of any tune, yet I find myself telling coworkers to "clean it up better; it'll be the first thing they notice!" Just passing my psychosis on before I leave the field, I guess. Why do people want to know what kind of wear you or the mythical "one" "should" get on bikes? I mean, common sense? Impressive about your brommie but what do you expect from a company of ENGINEERS and not marketers. And never leave your bike outside for long! If thieves don't get it, the elements will. I've found that "normal" wear varies greatly with weather and conditions. One day's ride on wet, dirty roads can result in significant brake wear requiring a play adjustment and removal of embedded grit from the brake pads. Similarly, chain wear varies greatly between dry summer riding and salty, wet winters. I am always sad to install a new chain just prior to the winter riding season because I know its life will likely be short and brutish. Surprised to hear how long your chain lasted. Although I regulary wipe my chain clean and lubricate it, plus brushing clean the cassette, I have to change the chain at least once a year. As for washing the rest of the bike I wait until I don´t know what colour it is. That´s what most commuters is like; quite dirty but with good components (and the bikes as well). I'm not sure I understand the chain wear thing. I ride my city bike casually, 10-50 miles a week (varies), only rarely lubricate the chain, and nothing slips. Do you - and others - see big consequences of not replacing chains and the like frequently? I hear lots of talk about the adverse consequences of such wear on chains/cassettes, but I have yet to experience any consequences of not paying attention to it. Maybe I just haven't worn it enough to be a problem? I can't complain about the upkeep on my bike - I use it for transport and long weekend rides, paths, roads, bush tracks and all in-between - pot holes, gravel etc. The main cost was adding components - back rack and handlebar water cage and better quality tyres and saddle - from there maintenance is very regular cleaning/polish and six monthly health check at the bike shop where it was purchased. In addition, my bike is kept indoors which protects it from environmental factors - I do take very good care of it and the cost is negligible when compared with that of a car. Certainly not recommended, but my elder sister used the same tires on her daily urban commuter for more than 7 years. Her final flat involved the rubber actually wearing completely away in a few spots. I wasn't there but hear her otherwise friendly LBS manager gave her a bit of a lecture. Chain elongation is objective and measurable. It is measured with a vernier caliper. Chain-checker 'tools' only tell you if the chain is new enough to satisfy the designer's notion of perfect shifting for Shifter System X. They are useless for commuters. They are too dumbed down to be considered tools. If you replace a chain without a measurement either the chain is very very bad or you are replacing it at random or on a whim. Many people are not prepared to face the simple arithmetic involved in computing chain elongation. Many people cannot operate a caliper and get repeatable measurement. Many people who would do just fine with a vernier caliper are intimidated by numbers. Those persons get to buy too many chains or wear out a lot of gear. I bought my Made in Japan Sears Craftsman vernier in 1965. I immediately discovered it was useful for a lot more than measuring chain. It is and always has been among the most used tools on the bench. Simply owning a vernier will save many trips to the LBS. +1 on the utility of the basic vernier. I have a couple of good basic quality machinist ones, a 9" that I use all the time and a 16" that I got at an estate sale for $10 that is too big to use for much of anything except maybe as a weapon. I have a $15 plastic one that is metric that saves me all the metric to inch-fractional conversions. You never have to guess about things like seatpost or handlebar diameters once you have one in the toolbox. It was handy yesterday when the 6005rs bearings I ordered for the bottom bracket on my pumptrack bike arrived and were the wrong I.D. I could give the skeptical but helpful woman on the customer service line actual measurements that verified that my bargain Chinese bearings were .020" undersized. I got to feel all professional and grown-up which is nice, it almost makes up for having to wait for more bearings to come before I can put that bike back together. It's hard to tell from the photo, but I think your brompton uses a combination of an internally geared hub with a derailleur to move over *2* cogs. As such you have substantially less deflection in the chain than on your Seven with its 11 cogs. You are also probably using a wider more robust chain on the Brompton. So, by design, you shouldn't be wearing chains at the same rate. Also how much shifting do you do with the derailleur vs the hub? One of my big reasons for using a fixed gear for commuting is lack of chain wear and maintenance. I normally would just swap out a chain once a year (in the spring), mainly due to the abuse of salt and sand from winter riding. Obviously not an issue with shifting. It was just rusted solid from all the salt. I would typically put 5-6,000 miles on the commuter in a year. This is past tense because lack of a real job means the commute is now down the hall. And this year I've been using snowshoes and x-c skis to get around outside. People want that chain replaced often to prevent wear and tear on the cassette, since if you wait too long you have to replace both. But it's a odd tradeoff because a chain doesn't cost that much less than a chain and cassette together. Plus, gears are made to wear out. So why not just replace the chain and cassette (and occasionally chainrings) when they do? It's not like the worn chain works less well than a new chain. That is my thinking as well. Although on the Brompton the 2-cog cassette thingie will probably be more expensive than on a regular bicycle, at this stage I might get it all replaced in one go. What!!!!!!!!!!! R u srs?? Worn chain is inefficient chain. Worn chain does not lubricate. Worn chain does not engage sprocket teeth efficiently. I have a modest proposal for the two of you. Clamp a cassette cog in a vise. Find a smooth round file handle about the same diameter as a chain roller. Try to produce visible wear on a cog tooth. Keep your work lubricated. No fair holding that file handle at an angle, keep it faced to the work. Those vise jaws are giving you a huge advantage relative to how it works on the road. If you succeed at all, go on to the rest of the teeth on the cog. Then to the rest of the cogs on the cassette. Wearing down cogs represents a lot of work. The more worn the chain the more pedalling effort goes into wearing down cogs and chain. As for the expense of chain you may stop buying the expensive ones now. You do not need the chain that matches your gruppo. While there is *some* difference between chains and I must admit to some sentimental favourites a fresh or lightly used $30 retail chain totally outperforms a $100 chain with only slightly more wear. I will assume no one who might read this buys Walmart chain. With that exception chains are pretty much the same. Those who ride 11spd cassettes and 'must' use high priced chains are suffering from self inflicted wounds. Wait a minute, there's a chain that matches the Brompton 6-speed gruppo? Oh the missed opportunity! Looking at your photo and reading the comment that you're lucky the gears haven't seized up is confusing. Isn't that in internal gear hub? Also, I'm trying to figure out why your experience is so unusual. What do you attribute that too? I mean three years of piling up miles on that bike and you've not replaced brake pads? 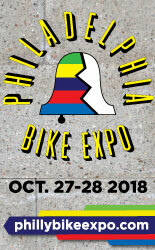 I go through a couple sets a year on my transportation bike and it seems my mileage pales in comparison to yours (but maybe not my braking)….The bike gods must like you! It is Brompton's unique 6-speed drivetrain, which involves both an internally geared hub and a 2-cog derailleur system with 2 pulley type thingies. The uncanny longevity of this bike's parts is probably due to a combination of my fairly light weight, tame pedaling style, and the above-mentioned wildcard factor. In other words - to some extent I just got lucky. Also, to clarify: The (Schwalbe Kojak) tires and the chain are in fact heavily worn. It's just that they remain functional regardless of that fact. As for the brakes, I do not use them much on this bike. While others have described Brompton's downhill handling as "scary" I do not feel that way at all and rarely feel the need to shave off speed when descending. No doubt that helps with brake-pad wear. You must not do much city riding with this bike. The stop and go aspect of traffic does it's damage on my brake pads. In an average day I may use mine more than you do with a month of constant riding on those longer country rides. And internal geared hubs should never freeze up, or so I hope since I ride one. The only time I've seen drivetrains with derailleurs freeze up is when the chain was completely rusted -- which can easily happen in some parts. Yup. I rode it in the city for the first year of ownership, then moved to rural Ireland. Now in the course of a typical commute, it is not uncommon for me to only use the brakes once - upon arriving at my destination. Be careful! Sometimes it's that bit of grease and grime that keeps things runnng smoothly, and together. We obviously went to the same school of bike maintenance. I reckon the chain on my 1939 Raleigh Sports model is original .. makes you think doesn't it ? You can run a chain a long time on a bike without derailleurs! They also last longer for lighter weight riders in flat terrain. Chains on my old road and mtn. bikes lasted about 1,500 miles tops before they "stretched" and were damaging the chainrings and cogs. On my current IGH equipped bike, I can go twice that distance. You may do better than me, as I'm a big guy riding in hilly terrain. I just don't see the argument for changing the chain frequently, at least on a modern bicycle. The casette and chainrings are both replaceable, at a price a few times the cost of a new chain. So by replacing the chain regularly, to reduce wear on the small cogs in the cassette (and, to a lesser degree, on the chainrings), you're simply spending more money on new chains. If you replace it frequently, say every 1000 miles or when it starts to show wear, you're spending a lot more. It makes more sense to wait, and then replace the cassette and any worn chainrings as necessary. People get so worked up about bike maintenance that it makes me think it's nothing more than example of conspicuous consumption. You have free time, and money, so you demonstrate it by making sure your bike is always in tiptop shape. Why bother? Bikes are durable, practical, and long-lasting. Dirt will not hurt them. Spend your time enjoying life, and riding, and relax about your dirty chain. While I appreciate your thinking here (i.e.-relaxing about anything is always a compelling argument), there are two reasons I change my chain before much cassette wear. First, once I've ridden enough to wear my chain significantly, the eventual poorer, crunchier, grindier match up of links to teeth makes for a distraction; discernible drivetrain smoothness adds to riding joy. Also, riding hard in a group ride and slipping gears up all the climbs is an awful feeling. Metal slipping forcefully on metal is cringe-worthy. This does depend on the kind of riding you do, of course, but relax: stay flexible and open to being be uptight and anxious about chain wear. 30 years ago, I was a racer in training, riding about 6,000 miles a year. I weighed 160lbs, rode a DeRosa, then a Triumph(Raleigh), and finally a Columbine(custom). I commuted on a Fuji(forget model) touring bike. I went through 700x25 tires every 4 months, chains every 6, brake pads(same), tubes(countless). 12-18t freewheels and derailleurs required replacement every year, as did bottom brackets and headsets. My wheels needed truing or a spoke replacement every 3 months or so, leading my wheelbuilder to routinely accuse me of jumping railroad tracks(which I didn't) . Of stuff I actually BROKE(not through crashes with pavement, other bikes, or Vista Cruisers(nother story)), count a Dura Ace crank and FD, Campy Super Record RD, Modolo Kronos (early carbon) brake levers, and a Cinelli stem among the victims. I even broke a couple Selle Italia Turbo Saddles and bent a couple Campy Record axles. And throw in half a dozen various cables. Thirty years and 50 pounds(okay, 60... okay, I'm Fudgy the Whale!) later, I'm riding about 3,000 a year. I just checked my chain after a year and a half and it still has another 6 months left. I ride 700x38 Compass and Vittoria tires. I can't remember my last flat and may rotate the front tire to the rear after another year. I'm 2 years into a 90's Deore RD I found on a Fuji left at the curb(love college towns!). My Selle Anatomica is 3 years old, and only about 25% into its tension bolt. My brake pads had no visible wear after 3 years, but I changed the pads for grabbier Koolstop Salmons. I got new, wider wheels a year ago just to be more compatable with wider tires, modern dropout width and greater choice as to cog ratios. My 7 y/o alloy Campy Chorus crankset and BB are still in perfect shape as is my 3 y/o Velo Orange Rando frame with a curb find ancient Stronglight headset. So why the big durability difference? The bigger contact patch and lower tire pressures make up for my added bulk. The bike itself is only 3 or four pounds heavier than my racing steeds. Working for a bike company 30 years ago gave me access to top shelf components. Even then, I replaced stoopid-light stuff like titanium bb and pedal spindles with steel, and went with 36 hole, 14 gauge 3x spokes to last as long as possible. Although my watt meter is collecting dust with my crabon bike, I guess my wattage output is only down 10-15 percent. I think the biggest difference is a matter of STYLE, if you will. I don't sprint for county line signs anymore to throw my wheels out of true. I don't try and hoist my formidable bulk out of the saddle on climbs and flop back down at the top, resulting in broken rails or popped rivets. I don't ride in pacelines, feathering my brakes, or come to a stop from 20mph on a dime. Even though I still friction shift, I don't rush it, and keep an ear out to make sure my derailleurs are trimmed. I think that even though the all-out efforts during training rides are brief, the high wattage and especially the side to side strain on bearings, spokes, chains, and aluminum components wears them out prematurely, and you can literally hear the abrasion with the pavement wearing down your tires. Although I'm much heavier now than in the mid-80's, I'm a lot lighter on my bike And my wallet! It's surprising how little expenses you've experienced with all your bikes and all those miles. I used to drive cars and would budget money for gas, wear and tear, insurance, repairs and so on….then I gave that up and started walking….still, there were expenses I had not anticipated….then I took up bicycling with the same story. it's been a bit longer than you, but knowing and accepting the costs involved with keeping our bikes ready for the demands we ask is helpful. it's still better than cars but not exactly without expenses. Here is a very interesting article on chain wear. http://sheldonbrown.com/chains.html I use a chain tool that measures pin wear. I use to hand measure pin to pin and when it was just off the pin, I would by then need to replace both cassette and chain rings and chain. I leave it up to you folks as to how you choose to decide when to replace your chain. I use Pledge on all of my bikes and after each ride I do a wipe down of my frame tubes with an old terry cloth and I use a clean wipe to give my chain a quick clean up of heavy stuff on the outside. I do a complete tear down every 500 miles. I clean the complete drive train and remove and clean my rear chain pulleys. This over kill I know, but I am old and retired so I have a lot of time to keep things clean and proper. I have three road bikes that I swap out for each ride so it takes me a bit of time to get the required 500 miles on any one bike. "cheap parts wear sooner than well made parts". Not always. Cheaper chainrings and cassettes are made of steel, while "better" ones are made of aluminium. The steel ones last me usually 3 times longer, at the expense of something like 400 gr extra. My urban bike still has its original crappy one piece steel crankset after 15 years. The middle ring of my "top range" mtb is like butter left in the sun, no matter how careful I change chains, it will wear out way too quickly. Cheap parts wear out sooner than well made parts, all else being equal. A cheaply made steel chainring will likely wear out sooner than a well made steel chainring, a cheaply made aluminum chainring will likely wear out sooner than a well made aluminum chainring, and so on.